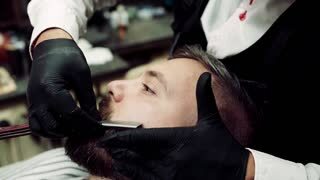 A close-up of hipster man client visiting haidresser and hairstylist in barber shop, beard trimming. Slow motion. 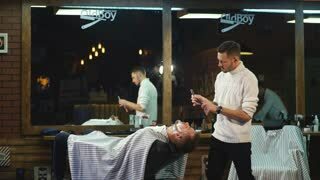 A hipster man client visiting haidresser and hairstylist in barber shop. Slow motion. 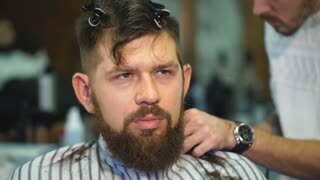 Handsome hipster man client visiting haidresser and hairstylist in barber shop. 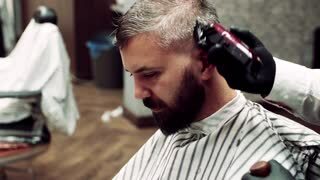 Handsome hipster man client visiting haidresser and hairstylist in barber shop. Slow motion. Handsome hipster man client visiting haidresser and hairstylist in barber shop, smoking a pipe. Slow motion. 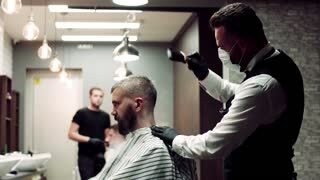 A hipster man client visiting haidresser and hairstylist in barber shop. 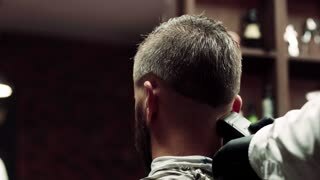 Rear view of hipster man client visiting haidresser and hairstylist in barber shop.